Ahhh fall is definitely upon us here in Vancouver. It’s back to bringing my umbrella everywhere I go regardless of whether it’s currently raining or not (because there’s an 80% chance it’ll start out of nowhere), tucking my Lululemons into my Uggs in the most unfashionable way to avoid the bottoms getting wet, and regularly consuming non-fat half-sweet no-whip pumpkin spice lattes. These are the days I live for. Now I need one of you to remind me what I just wrote in two weeks when I start complaining about the cold and rain. But for the time being, I will appreciate cold sunny days and rainy gray days and finally being able to wear boots and sweaters again. But just because the sun has gone into hiding and tank top season is over doesn’t mean we can’t still work on developing some fabulous arms! Whenever I work smaller groups like my shoulders, biceps, and triceps I like to incorporate some high-intensity activity to keep my heart rate up. I don’t get quite the same burn from pumping out dumbbell curls as I do from heavy squatting. Lately I’ve also been trying out some CrossFit-inspired workouts. I have a Groupon for a local box that I’ll be trying out in the next couple months and I don’t want to look like a total jackass, so I’ve been trying to prepare myself at home. Annnnd I love it. I’m concerned this is going to turn into an expensive past-time, but we’ll cross that bridge when we get to it. My workout today was a glamour-muscle circuit with a slight CrossFit feel to it. Set a timer for 45 minutes and complete 10 reps of each exercise in circuit 1, then circuit 2, then circuit 3. 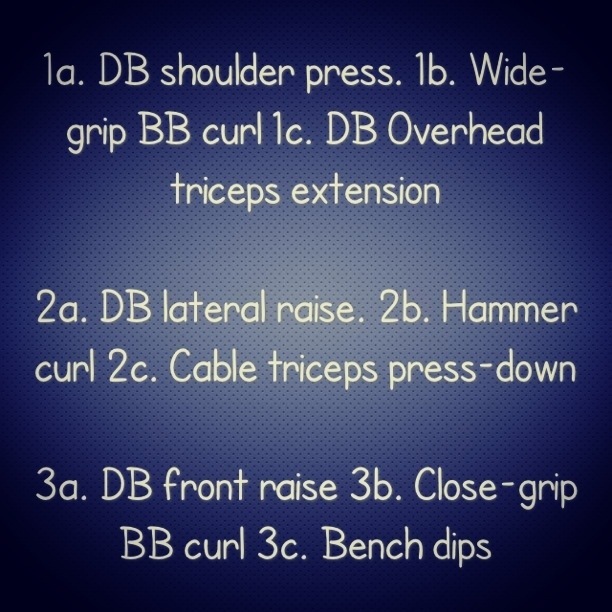 Each group of 3 exercises is considered one circuit. See how many rounds you can complete within that 45 minutes, but remember to never compromise form for speed. Now, want to know how to really get your heart going during this? Perform 200 skips with a skipping rope between each circuit. Not only will you feel the burn in your shoulders by the end of each skipping round, you’ll be sweating buckets by the time you’re done! Today I was able to complete 3.666666 rounds; my timer rudely went off just as I was about to start the third circuit of my fourth round. ! This entry was posted in Fitness, Workouts and tagged bodybuilding, cardio, crossfit, exercise, fitness, HIIT, strength training, training, weight lifting, weightloss, workout, workouts. Bookmark the permalink.